Pictured, from left, are Chuck Bowlds, OrthoCity; Brad Sutter, OrthoCity co-owner; Trina Hoy, Warsaw Evening Optimist Club president; and Brad Bibler, OrthoCity co-owner. 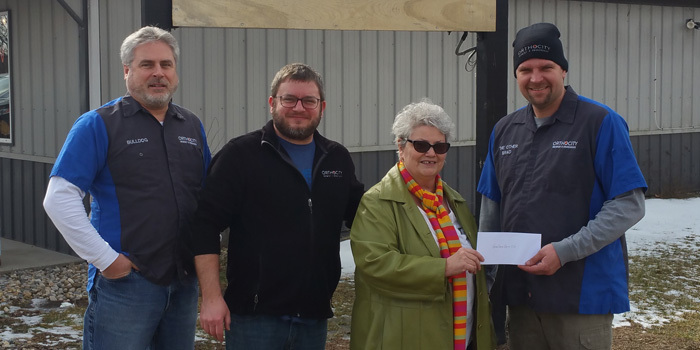 KOSCIUSKO — Recently, OrthoCity Brewery and Smokehouse dedicated a percentage of one day’s profits to benefit the Warsaw Evening Optimist Club. These funds will be dedicated to empowering and encouraging young ladies through a newly-formed leadership academy. The Evening Optimist Club is a new club formed on Aug. 16, 2018, created by women and dedicated to be friendly and welcoming to all while benefitting local children. The Evening Optimist Club meets from 5:30 to 6:30 p.m. every first and third Thursday evening of each month, in the conference room at Wire and Steam Coffee House. There is no cost to attend; however, joining an Optimist Club is for a noble cause and shows great promise in one’s self.